Acipenser fulvescens: Acipenser is Latin for "sturgeon and esteemed dainty fish," fulvescens is Latin for "becoming tawny, somewhat tawny (yellowish brown)"
Lake Sturgeon, sometimes called a living dinosaur of the fish world, are a remnant of an ancient and primitive group of fish that have cartilaginous skeletons and bony plates in their skin. Lake Sturgeon are one of three species of sturgeon that live exclusively in freshwater, the other two species are Shovel Nosed Sturgeon (found in Minnesota) and Pallid Sturgeon (Federally listed as an endangered species, not found in Minnesota). There are twenty-seven species of sturgeon worldwide, all of them found in the Northern Hemisphere. Lake Sturgeon almost disappeared from Minnesota in the early 1900's. During the 1800's sturgeon were considered a nuisance fish because they easily broke through commercial fishing nets. They were taken out of the rivers and lakes they inhabited and stacked on the shorelines like logs; sturgeon were also used to power steam boats because their meat has a high oil content. In the late 1800's sturgeon eggs were recognized as a dining delicacy. They were harvested by the 1000's for their caviar until the population crashed in the early 1900's. This dramatic harvest along with significant habitat changes around the sturgeon's spawning areas nearly drove the entire population in the United States to extinction. Currently Lake Sturgeon are listed as a Species of Special Concern in Minnesota and have strict regulations for harvest. Historically Lake Sturgeon were found throughout the Mississippi River and its tributaries including the Missouri and Ohio rivers from Minnesota to Louisiana, all of the Great Lakes and most of the St. Laurence Seaway, the Red River from Minnesota to Hudson Bay, and many tributaries of Hudson Bay. 19 of the 20 States that Lake Sturgeon were found have Lake Sturgeon listed as a threatened , endangered, or species of special concern. Lake Sturgeon is considered extirpated from Louisiana, Alabama, and Arkansas. 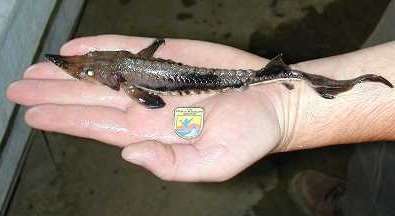 Lake Sturgeon are endemic to each major watershed in which they are found. For example, Lake Sturgeon found in the Great Lakes do not interact with Lake Sturgeon found in the Hudson Bay watershed or the Mississippi River watershed. Restoration projects that include stocking Lake Sturgeon in each of these major watersheds use brood stock that comes directly from the same watershed. Tagged sturgeon have been tracked migrating 300 miles or more throughout contiguous bodies of water. They forage in areas with sandy, gravelly and muddy bottoms using their snouts to stir up the benthic material and their powerful sucking mouths to draw in the water and floating debris. 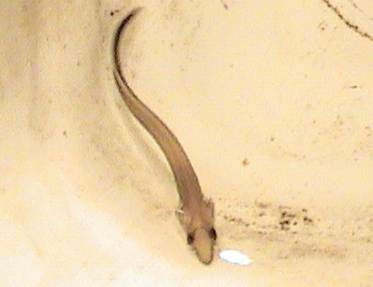 The small particles of sand and muck are expelled through their gills and the larger food items are consumed. Sturgeon primarily eat aquatic macroinvertebrates, freshwater mussels, snails, crustaceans, and small fish. They do not eat decomposing or dead organisms, preferring fresh food even in hatchery situations. Around mid-May through June, when water temperatures reach 50 degrees F, sturgeon begin to migrate to their spawning habitat. They spawn in shallow rivers that have clear water and gravel or cobble bottoms free of silt and sand once temperatures reach 55 degrees F. During this time the males arrive before the females and neither forage for food until they leave the spawning grounds. The females, accompanied by two males, lay hundreds of thousands of eggs generally in one or two days and the males fertilize the eggs after they are released from the female. The eggs stick to the rocks and gravel at the bottom of the stream and hatch in about 5-8 days; ideal water temperature for hatching is 59-64 degrees F.
Sturgeon spawning habitat is being threatened by the introduction of zebra mussels. Zebra mussels attach to hard surfaces and can cover rocks in one season leaving no space for sturgeon eggs. Zebra mussels are found throughout the Great Lakes watershed, Mississippi River watershed and have recently been discovered in the Red River & Lake of the Woods watershed. The freshly hatched sturgeon have a large yolk-sac on their belly and are called sac larva. They settle into the rock crevasses and feed off of their yolk-sac. After 10 days the yolk-sac is consumed and the larva are now able to swim up into the river current. They float downstream and settle out in areas with sandy bottoms to feed on burrowing invertebrate larva and other small organisms in the benthic substrate of the river. The larva grow rapidly and in about five months they are five to seven inches long and are now fingerlings. For the next five years the fingerlings continue to forage in the river for larger aquatic invertebrates, freshwater mussels, small snails, and fish. They continue to grow rapidly and by five years old they are now around 20-inches in length and are ready to migrate into larger river and lake systems. At this point the sturgeon are still juveniles and will not reach sexual maturity until 15 years for males and 25 years for females. Their growth slows significantly and they generally grow to 45-50 inches by the time they reach sexual maturity. Once sturgeon reach sexual maturity they return to the spawning grounds where they were born. The females spawn once every four to eight years, and the males spawn every one to two years. Males have a shorter life span than females. Generally males live for 65-90 years and females can live over 150 years. Most predation of sturgeon happens during the egg stage. Sturgeon eggs are vulnerable to predation by larger benthic organisms such as crayfish, and small fish. Fingerling and small juvenile sturgeon can be predated by herons. By the time sturgeon reach 20 inches or more in length their primary predator is humans. To learn more about fishing for Lake Sturgeon and how to handle a Lake Sturgeon if you are lucky enough to catch one see our Piers & Places and Fishing Equipment & Tips articles. Among Great Lakes Indians, the Lake Sturgeon was the most respected of all fish. The Ojibwe referred to it as Nahmay or Namé, meaning the king of fish.